I just don't know how to begin telling you about Tilvee. It certainly is VERY RARE that I cannot find the words to express my feelings and thoughts. Being speechless is something that never happens to me. Ok Maggie, get a grip. Tilvee is committed to green business practices and uses ingredients that support sustainable, organic and fair trade agriculture. The founder of Tilvee, Kristie MacNamara, received her degree in Botany and Organic Chemistry in 1997 from Michigan State University. She worked in a local natural market during and after college which linked her education and fascination with plants, their uses in the formulation of and niche for natural and organic skin care. She began formulating and opened the skin care company Body Botanicals in 2000 which has been sold nationwide. In the past few years, Kristie's extensive research into the benefits of antioxidants in skin care planted a seed. She began formulating new products that were in line with this vision which became Tilvee eco-ethical skin care company. With Tilvee she has created a socially and environmentally responsible company that offers luxurious, safe, innovative organic products. Kristie is also passionate about green business practices, consumer education and being involved in the community of eco conscious individuals and businesses. All throughout Earth Month, Tilvee is offering 25% off each product that they carry! WHAT A DEAL! So, if you are not lucky enough to win their prize, you can buy it for 25% off! Let me tell you about the products that I reviewed! 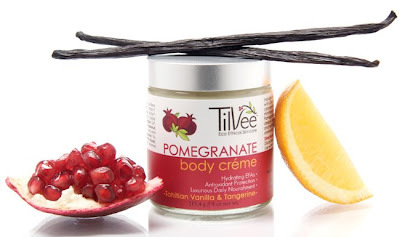 First I tried the Pomegranate Body Creme - Tahitian Vanilla & Tangerine. Not only does it smell heavenly but it nourished my skin like no other Body Creme that I have ever tried. I have super super dry Michigan hands. I am a germ-a-phob so I am constantly washing them which leads to my hands cracking and bleeding! I dipped into this ultra rich moisturizer and immediately it sank in to my skin and left my hands feels uber soft. The smell is out of this world. I am not a "scent person". I love smelling good but I hate fake scents, a lot! This was natural and not overpowering at all. Even my husband liked it! This creme retails for $19.99 and with the Earth Day promotion, it is now $14.99! I would beg, borrow, and steal for this creme, thats how much I like it! Dexter just developed eczema. My husband had it as a child and I was fortunate enough to get it post-natally (is that a word?!) I have used steroid creams on mine and they seem to keep it at bay but I refuse to put steroidal cream on Dexter. He is too precious and perfect for that. Soooo......I tried Tilvee's Mandarin Remedy Balm and within 4 days, Dexter's eczema is gone! Gone I tell you. His elbow rash is almost gone, but the eczema on his knee is non-existent now thanks to this "Miracle Balm". A remedy balm for even the most delicate skin that soothes lifes little knocks - 79% Organic ingredients. Use the Mandarin remedy balm on eczema, rashes, wounds, bug bites, burns and more. Calendula and chickweed extracts are known for their powerful skin soothing and healing capabilities. Mandarin is known for its calming and uplifting properties. Massage gently into the skin, especially after bathing and at night before sleeping. Discontinue immediately if rash or irritation occurs. Normally it retails for $14.99 but it is only $11.24 after the Earth Day promotion. The cute glass jar has a lot of balm in it so I am sure it will last for quite a while. I cannot wait to use it this summer on bug bites! I never thought I would actually be looking forward to bug bites! I really cannot say enough about Tilvee or their products. Kristie is awfully nice too! Do you want to win any product of your choice? Head over to Tilvee and pick out the product you would want to win (other than the two I mentioned). (Don't worry, if you want the balm bad enough, you can pick that as your prize, I just want you to check out their other AMAZING organic products!!) Comment on this post with the item you want AND leave me your email address. If you become a new follower of mine either on Twitter or Blogger you can have an extra entry!! As with my other amazing Earth Day giveaways, this giveaway will end on May 10th at NOON EST. What are you waiting for, Tilvee is calling your name! I'd want to try the Pomegranate Body Butter. The Antioxidant Replenishing Cream sounds great for my wintery skin. I want to try the Calendula & Comfrey Remedy Balm and the Tea Trea Facial Cleansing Bar. I get super dry hands too b/c I work at a hospital and purell my hands constantly, leaving little cuts and severely dry patches that then get super itchy. Tilvee has a really great website. I'd pick the Muscle & Joint Recovery Balm, partly for me and partly for the DH. He gets sore muscles all the time from playing sports and I'm the one who has to rub in the ointments and such to ease the pain. So for him it would be nice to feel the relief and get the back rubs, for me I wouldn't have the nasty smell of his current rub plus I'd know the product was more natural than what he's using now. Acai Pomegranate Rejuvenating Masque for sure! I haven't done a mask for myself in soo long so it would be nice to take a bath and relax with this! I'd like to try the Lavender and Chamomile Soap. Love both of those ingredients! Thanks! LOL!!! I have a product that I feel the same way about...will be posting review/giveaway next week! Anyway I would love to try their Botanical Rejuvenating Oil. Thanks for the opportunity! I could really use the Muscle & Joint Recovery Balm this morning... my poor back is really aching! That would be my choice! Thanks for the awesome giveaway! My skin could really use the tea tree facial cleansing bar! Pomegranate Body Butter would be great for my daughters rough knees. If the Peppermint & Teatree Foot Rescue Creme is as good as the products you tried I would love it! I would love to try the Antioxidant Replenishing Creme...normal to dry skin and I am at the age where I am starting to get fine line and wrinkles so this would be great. I love the smell of teatree oil, and my feet are atrocious! So I would love to try the Peppermint & Teatree Foot Rescue Creme. I would like to try the Tea Tree Facial Cleansing Bar or the mandarin mellow soap. Thanks! I'd love to win the Raspberry Hydrating Toner. Thanks for the giveaway! I like the foot rescue creme! My favourite item from their store is the Peppermint & Teatree Foot Rescue Creme. I'd love to try pomegranate lip conditioner! Oh could my feet ever use the peppermint and tea tree foot lotion! I'm a new follower today! The Acai Pomegranate Rejuvenating Masque sounds wonderful!! since I have dry skin, wrinkles and scars-I think the Botanical Rejuvenating Oil would be the perfect item for me to try out! Acai Pomegranate Rejuvenating Masque sounds wonderful! I would also love to try the Pomegranate Lip Conditioner! I'd like the Acai Pomegrante Rejuvenating Masque. It sounds refreshing and my skin is sensitive. I'd love to try the pomegranate lip conditioner! Acai Pomegranate Rejuvenating Masque...looks great! Cranberry Clarifying Toner. I've been using Burt's Bees products but recently ran out...it'd be nice to get something natural that's also soothing to the skin! I'd love the Lavender & Chamomile Soap! 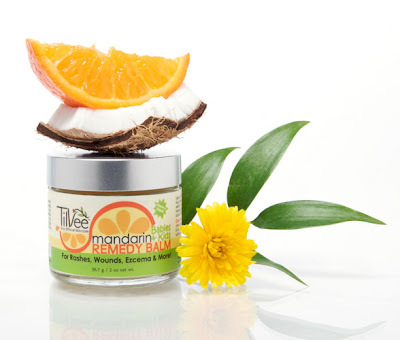 Wow, Tilvee Eco-Ethical Skincare offers some fantastic products! I saw several I would love to try and the Acai Pomegranate Rejuvenating Masque for the face just really caught my eye! I have been wanting a nice facial mask for a while now and this sounds like the ultimate at home spa like facial experience! Thanks so much for the opportunity to enter. I'd love to try the Pomegranate Body Butter. I love the peppermint and tea tree foot creme. My feet are always extremely dry and cracked so this would definitely be a lifesaver. The orange mint lip balm sounds great. Pomegranate Body Butter please! My dry skin is crying out for relief! Oooh, Acai Pomegranate Rejuvenating Masque. Sounds lovely. The naked hydrating lip balm would be really nice. I'd love to try the Acai Pomegranate Rejuvenating Masque, it sounds fabulous!